As a social worker, I work with young people in Out of Home Care and families in crisis. I urged that we create new and welcoming spaces in the Church that meet our young, disadvantaged Australians where they are at. One of my highlights was the opportunity to partake in small group discussions where we broke open the preparorty document for the Synod on Youth. The chance to connect with other young people and hear such diversity of experience was invaluable. The passion was contagious! After the group discussions a representative from each group presented back to the assembly and we genuinely felt that our voices, as young people, were valued. 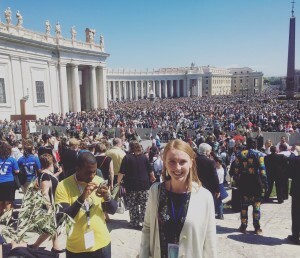 The Saturday Vigil and Palm Sunday Mass at St. Peter’s Square with Pope Francis were moments that I will never forget. The Pope wants to hear our voices! What is needed, Pope Francis said, are young people who walk, who go out on the street and “move forward beside others, but looking toward the future.” This is an exciting time to be a young person in the Church. I look forward, with anticipation, to continuing this Synod journey. As a social worker working for CatholicCare in the Diocese of Broken Bay, I will be talking about my hopes for the local Church in Australia from the Synod and the Year of Youth. 1. My first hope is that we can engage our most disadvantaged youth on the margins of society. As a social worker, I work with young people in Out of Home Care and families in crisis. My work is challenging, messy, unpredictable at times, and crisis driven. Many of the young people that I work with have come from trauma backgrounds, domestic violence and neglect. They are hurt. They have been let down by the people closest to them and they are searching. They are searching for an identity, a family, a place to belong, a dream and a passion. Ultimately, they are searching for something or someone to love, and to have that love reciprocated. When they cannot find what they are after, they turn to drugs, alcohol and toxic relationships to meet their needs. 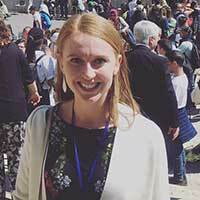 One of my hopes for the local Church in Australia from the Synod and the Year of Youth is that we can better engage our most disadvantaged and marginalised young Australians. 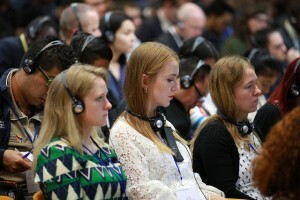 Yes, the Church-going young Catholics sitting in the pews on Sunday comprise a small percentage of youth. But how can we engage the 16-year-old Aboriginal girl living in a CatholicCare residential group home in Sydney? How can we engage the 20-year-old young mum who has spent her youth moving from foster home to foster home and now has a child of her own? Last month I gained a new client, a 14-year-old girl living in a group home who had been removed from the care of her parents due to domestic violence and neglect. As we were getting to know each other, this young girl was very proud to tell me that she had created her own religion. I asked her to tell me more about it and, essentially, she described it as a religion where “everyone is accepted for who they are.” She said there was only love in this religion and no fighting with other religions.” As I listened to this girl talk, she essentially described everything that our Church envisions itself to be. If this girl, who is living in a CatholicCare residential home, believes that she needs to create her own religion to find one that is welcoming, loving and accepting of people from all walks of life, it makes me wonder what her experience of the Church has been. I see this both as a personal challenge in my work, but also a hope that I have for the Church in Australia – to create new and welcoming spaces that meet our young, disadvantaged Australians where they are at. I attended Catholic schools in Australia for eleven years and I was blessed to be presented with several opportunities, both at home and at school that made me aware of the presence of God in my life. However, the vast majority of my peers in Australia – many of whom were educated at Catholic Schools – are alienated from practicing faith within the Church. They often do wonderful work with the disadvantaged through St Vincent de Paul and other good works of generosity; they are passionate about the environment and addressing climate change, but frequently the link is not made between social justice and the Church, despite the link that is so evidently there and which underpins the Gospels. There is great potential to invite young people more deeply into the fullness of the Church by using the common yearning for social justice as a bridge. Many young people want action and they want to be part of something that is real, practical and radical. I have seen in many of my peers a great desire to be part of something greater than ourselves. It is here that the Church has great potential to provide avenues to engage our peers who are searching for meaning, hope and action. One of my great hungers and the hunger of many of my peers is the desire to be part of a community. We will find them where we can: friends, music festivals, soup kitchens, university clubs and sporting teams. Despite the media perception that society has become more individualised and young people are becoming more self-focussed, as humans our dreams and identities can only be fully realised in community. When I think of my grandmother, her community was her local parish which was located up the hill and around the corner from her house. Ever since she was a young woman she’d arrange the flowers for Sunday Mass, clean the Church, bake cakes for morning tea after Sunday morning Mass and participate in the life and spirit of the church. Regina Coeli Catholic Parish in Beverly Hills, Sydney was her community as a young mother at the age of 25, right up until she passed away at 81. The reality in Australia today is that most young people are not finding their communities in their local parishes, predominantly due to the decline in young people who are attending Sunday Mass. While I am involved in my parish, for me the communities where I experience my greatest growth and formation are at a Diocesan level and through the Young Marist community that I am a part of in Sydney. Both these communities are made up of young people from diverse geographical areas who are searching for peers with whom to grow closer to God. One of my hopes for the Church in Australia is that we can create new spaces for community within the Church. There is a great need to be creative as we navigate a way forward. 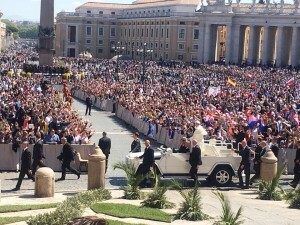 Conclusion of the youth meeting with Palm Sunday Mass, St Peter’s Square. My personal faith journey has been heavily shaped by role models who have not only planted seeds in my life but nurtured and guided me along my faith journey. I know that many are not so privileged. My hope for the Church in Australia is that we see a revitalisation of wisdom figures, role models and mentors who are at peace with themselves, who can cope with suffering, who are helping others and who are showing the way to life in abundance. 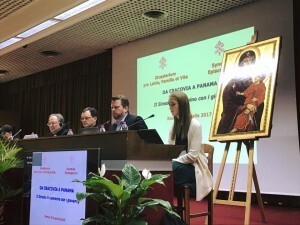 I believe that the greatest fruits of this Synod will come from listening to the language of young people – the words we reach for, the images that move us, and the music which calls us to consider our deeper desires… To paraphrase Saint Ignatius of Loyola, to go in our door before attempting to lead us out your own. Photo credits, Ashleigh Green and Malcolm Hart.